Grumeti Serengeti Tented Camp age is truly just a number! Young or old, this vibrant and rejuvenating haven charms all guests with its warm welcome and dramatic setting. Relax right on the water’s edge and unwind to the playful frolics of our resident family of hippo. Just make sure you don’t try to take a walk on that extra green patch of lawn - it’s really a floating garden of water cabbage that is home to some of Africa’s biggest crocodiles! Nestled among evergreen trees on the water’s edge, &Beyond Grumeti Serengeti Tented Camp offers a wild and remote experience in the thick of the animal action. Set on the banks of an oxbow lake, it is the perfect vantage point to watch the vast masses of the Great Migration making their dramatic river crossing. Dense riverside thickets hide a multitude of secrets and delights, from the acrobatic antics of colobus monkeys to the brilliant plumage of dozens of bird species. Step into a blaze of colour in one of only ten flamboyant tents under shady palm frond roofs. Bright, whimsical interiors welcome and invigorate. Vibrant surprises await at every step, from beaded curtains to intricate mosaic surfaces table tops. A spacious outdoor shower is shaded from the sun and stars by a wrought iron dome. Night time becomes an adventure, as hippo call to one another while you lie in the comfort of your king size bed. The Serengeti is home to literally millions of large herbivores, as well as the accompanying carnivores and prolific birdlife. The Park boasts more than 35 species of plains-dwelling mammals and is renowned for its annual wildebeest migration. Almost two million wildebeest, zebra, eland and Thomson’s gazelle follow the annual rains through the Serengeti to the adjacent Masai Mara National Reserve in Kenya in search of prime grazing. As the dense herds of herbivores move across the plains, they are shadowed by predators and scavengers. The Serengeti is famous for its lion population and a number of prides inhabit the Grumeti area. While largely nocturnal, spotted hyena make the most of the passing annual Migration. At such times, the hyena may be spotted wandering among the herds in the plain light of day. Another scavenger typically encountered on the outskirts of the Migration is the vulture, with the African white-backed vulture and the Rüppell’s vulture outnumbering the other species. With the grasslands largely open, October is a good time to watch cheetah hunting near Grumeti. At &Beyond we seek to maintain a low impact on the land while deriving high yield for our conservation initiatives by creating very small luxury lodges that support enormous tracts of bio-diverse land, which remains untouched. At every lodge we seek out small (and sometimes not so small) but meaningful ways of putting our values into action every day. Each &Beyond lodge supports the conservation of wildlife and contributes to its neighbouring communities in one way or another. In addition, we seek to limit our impact in terms of fossil fuels, the use of renewable energy, water and waste management, and recycling. At &Beyond Grumeti Serengeti Tented Camp, a doctor is employed full-time by the camp to assist with local staff community health and villagers are trained how to plant vegetable gardens.  Weather: Grumeti experiences pleasant temperatures, although summers can be hot and humid.  Rainfall: Rainfall is seasonal with the so-called ‘short rains’ in November and December and the ‘long rains’ from March to May. The average annual rainfall is 800mm to 1000mm.  Temperature: Generally, temperatures are pleasant, sometimes rising above 32°C/90°F. September, October and January are the warmest months. Temperatures rarely drop below 10°C/50°F. July is usually the coolest month. 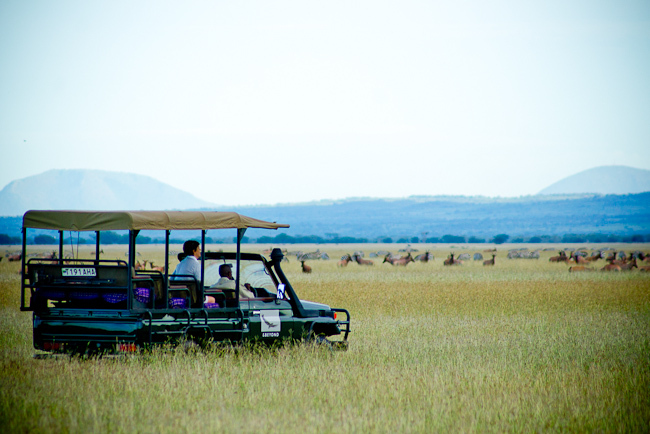  Best time to travel: There is excellent game viewing throughout the year. The migration is a 12-month cycle and the best time to see the migration at Grumeti is June and July. These months fall in the dry season. The Great Migration usually crosses the Grumeti River affording excellent viewing of the enormous crocodiles in action.  Malaria: Please note Grumeti River Camp is situated in a malaria area and necessary precautions should be taken.  Camp closure: Grumeti closes during April and May each year during the long rains.